So everyone has been saying that they can’t stand the thought of turning their oven or stove on during the summer to make some food. I don’t share this sentiment because, growing up in Arizona, I’m used to cooking in the heat! However, I will say that throwing together something healthy and delicious without having to cook it is extremely convenient so I thought I’d share my most recent favorite snack with all of you. 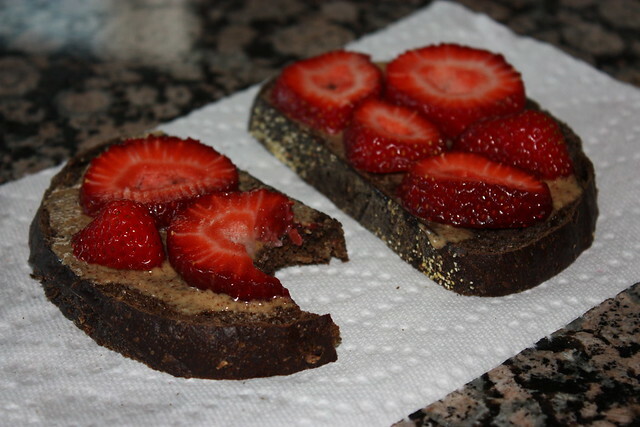 3) Arrange the sliced berries onto the bread and enjoy! Easy, right!? It’s really yummy, totally customizable, and good for you! You really can’t beat that.